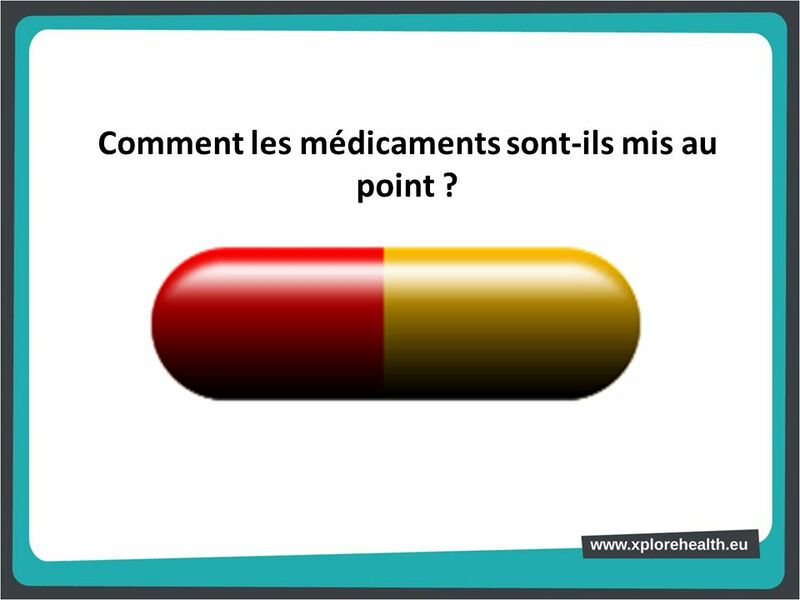 1 Comment les médicaments sont-ils mis au point ? 2 Qu’y a-t-il à l’intérieur ? 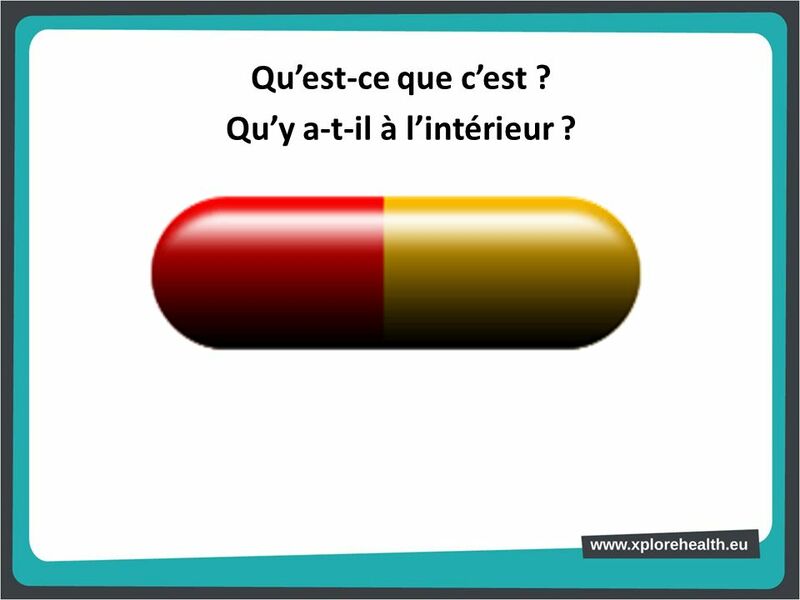 Qu’est-ce que c’est ? Qu’y a-t-il à l’intérieur ? 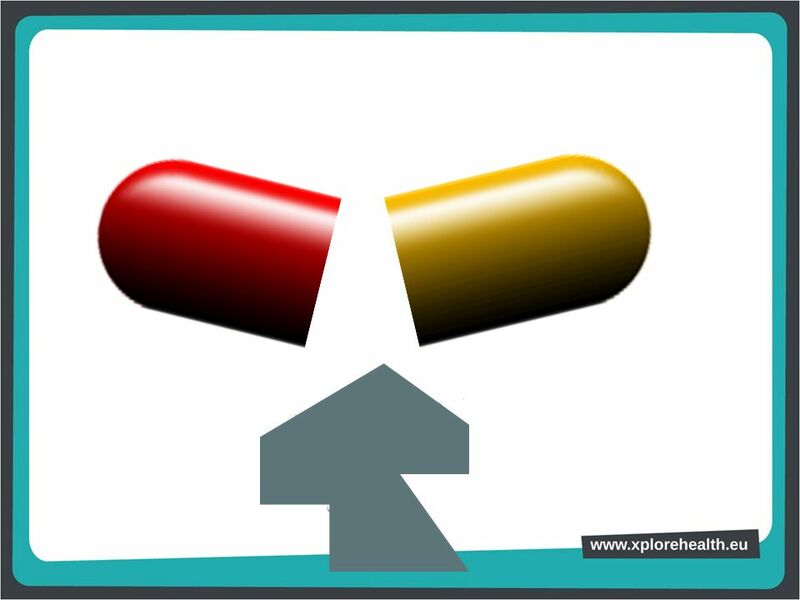 With a large capsule representing a medicine, ask students: What is it? What’s inside? (They will probably know that it’s a medicine): A medicine consists of an active substance or substances and excipients. 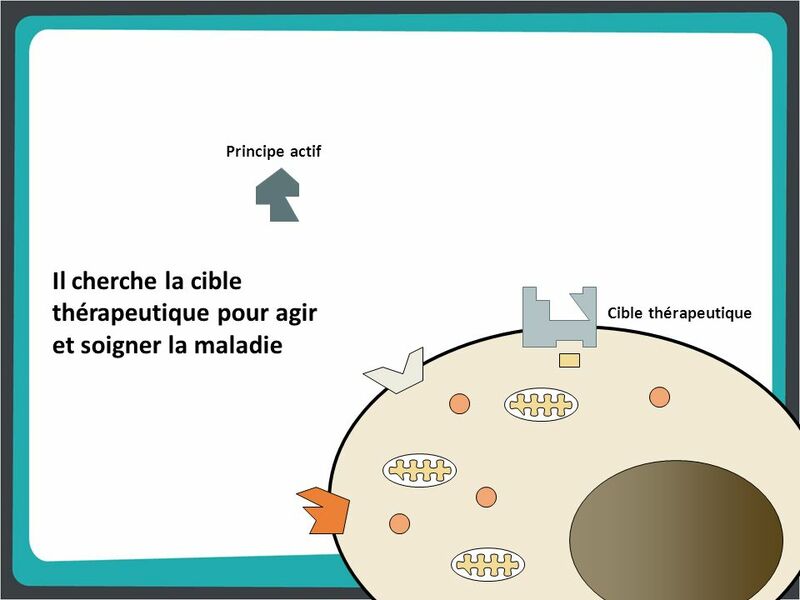 3 Qu’y a-t-il à l’intérieur d’un médicament ? You then open the capsule, which contains different objects representing the contents of a medicine: A chemical structure made from molecular models that represents the active substance, A plastic lemon that represents the aroma, A small packet of sugar, representing a nice flavour, A plastic strawberry, representing colour, Some coloured balls, to improve its appearance, Some plastic bubbles for protection, etc… The most important part of a medicine is the active ingredient, which is the biologically active substance that is capable of altering the metabolism of the cells that it affects. A medicine is a drug, or set of drugs, that have properties capable of preventing, treating, relieving or curing diseases or illnesses. Excipients are pharmacologically inactive substances. There are many kinds of excipient and their functions are: to improve flavour, colour and appearance, to make the medicine soluble or protect the active substance, etc. What do you think that this molecule does when it enters the body? (Students must think about what happens when we ingest a medicinal capsule and how it arrives at the right place to have an effect [digestive system, circulatory system, etc.]). The shape of the piece of the jigsaw should help us work out where it fits. If we imagine that it is an arrow, it has to have a target. We can then explain that the drug looks for its “target”, in this case a “therapeutical” target, to have an effect and cure the disease. 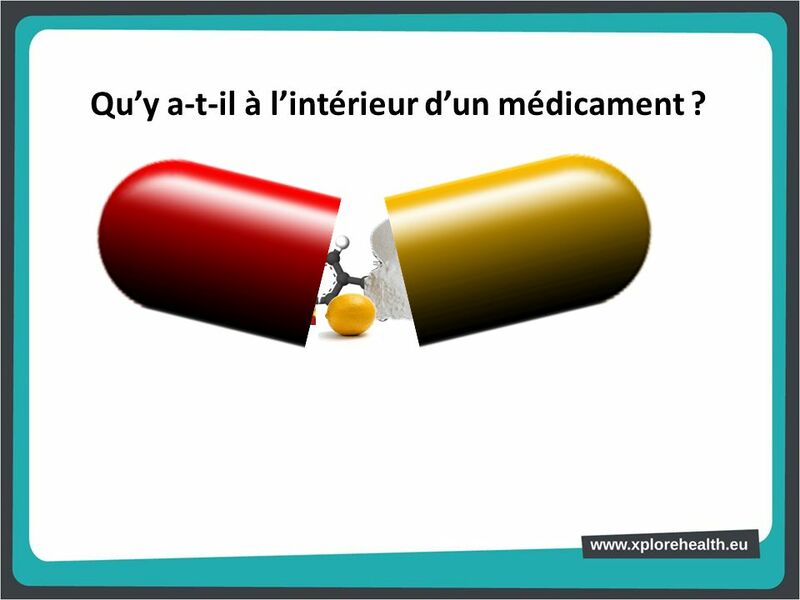 7 Comment les médicaments sont-ils mis au point ? 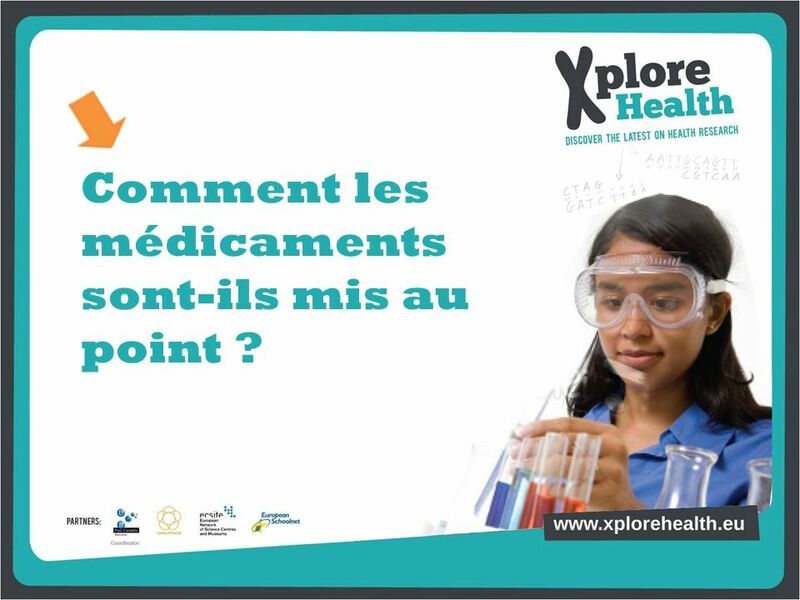 Going back to the initial capsule, we can ask students: How are medicines developed? What process should a drug follow to reach the market? How long do you think it takes to launch a medicine on the market? 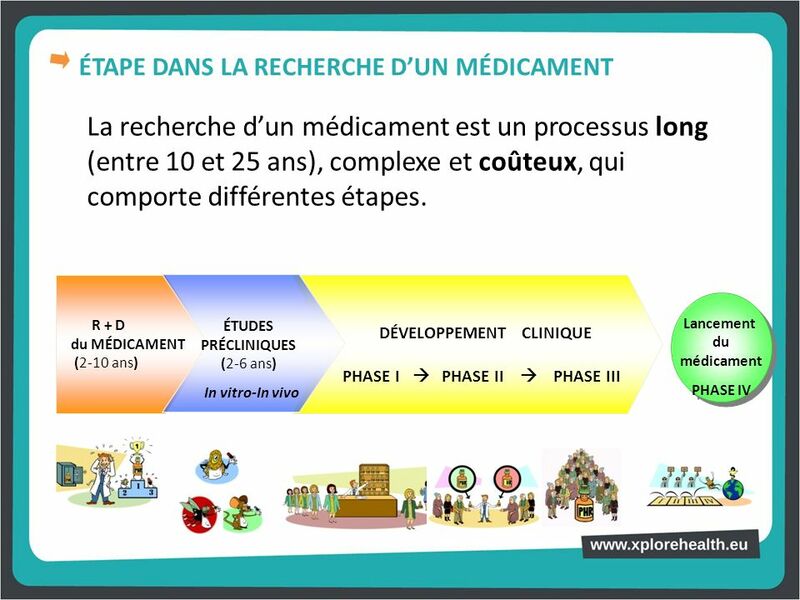 ÉTAPE DANS LA RECHERCHE D’UN MÉDICAMENT La recherche d’un médicament est un processus long (entre 10 et 25 ans), complexe et coûteux, qui comporte différentes étapes. 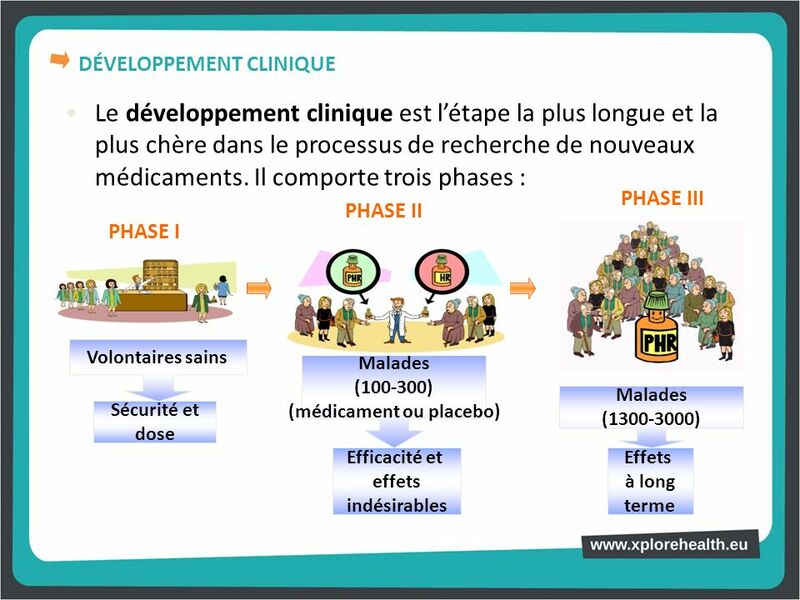 R + D du MÉDICAMENT (2-10 ans) ÉTUDES PRÉCLINIQUES (2-6 ans) In vitro-In vivo DÉVELOPPEMENT CLINIQUE PHASE I  PHASE II  PHASE III Lancement du médicament PHASE IV The search for a medicine is a long, complex and very costly process (the phases are then briefly described, as they are explained in detail on the following slides). Launching a drug on the market is a very long process, taking an average of 20 years. It is very complex and requires huge economic investment. It consists of several stages: the first is the research and development of a possible drug candidate, the aim of which is to find a substance that could be a good active ingredient for the disease being studied. 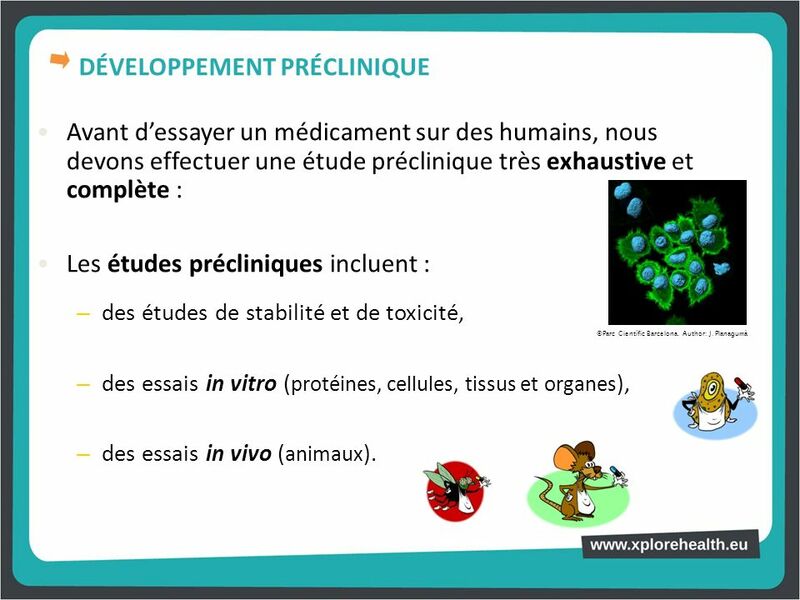 This stage is combined with the preclinical study stage, consisting of testing the drug candidate in cells and animals. If the results of these studies are positive and no side effects are detected, the drug candidate would enter the clinical development stage, which consists of testing it in humans. If this stage is passed, with no or very reduced side effects, the drug will reach the market. 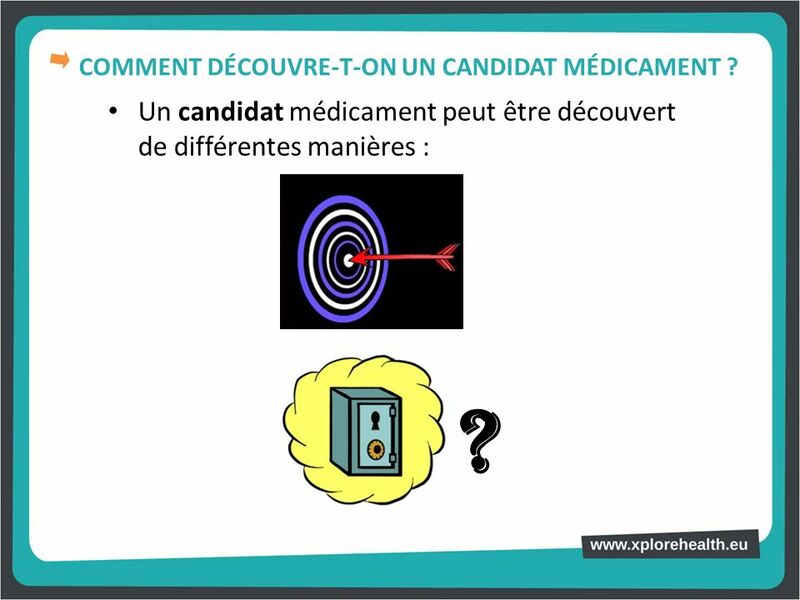 10 COMMENT DÉCOUVRE-T-ON UN CANDIDAT MÉDICAMENT ? 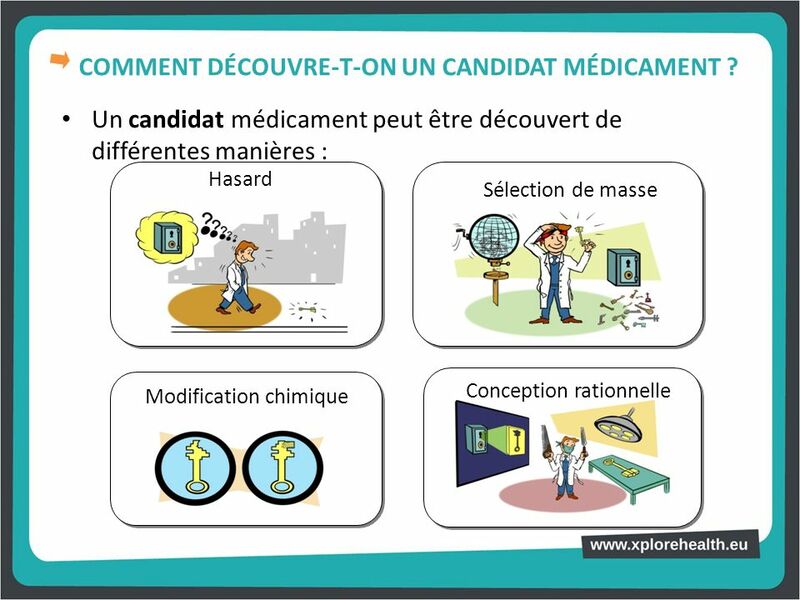 Un candidat médicament peut être découvert de différentes manières : Modification chimique Hasard Sélection de masse Conception rationnelle A drug candidate can be discovered in different ways: One way would be to discover the key by chance or serendipity along the way. In the medicines world, there are many examples of drugs that have been discovered by chance. One example is Viagra. The drug was initially intended to reduce the blood pressure of people with hypertension. When it was tested in patients, it was found that the volunteers were enjoying the tests, despite its low anti-hypertensive effect. It was then discovered that one side effect (erection) was more important than its therapeutic effect. As there was no medicine available for erectile dysfunction at the time, that is how Viagra came about. Another procedure is massive screening: it consists of testing many different compounds (of animal, marine or vegetable origin, etc.) to see whether any of them are active in the disease under study. Chemical modification: this would be like having a key that doesn’t fit properly in the lock, but if we modify it (by filing it down or adding a piece, for example) we are able to create the key that opens the safe. Sometimes we want to improve the characteristics of a drug that we know is active, so we chemically modify part of the molecule to obtain the desired effect. Finally, rational design consists of making a mould of the lock and then making a key to fit it perfectly. In research labs, this can be done by studying the therapeutic target. For example, if we know the structure of the protein affected by the dysfunction, we can design a molecule to fit it. Now that we have a drug candidate, ask: Do you think that we can go ahead and give it to patients? If not, why? 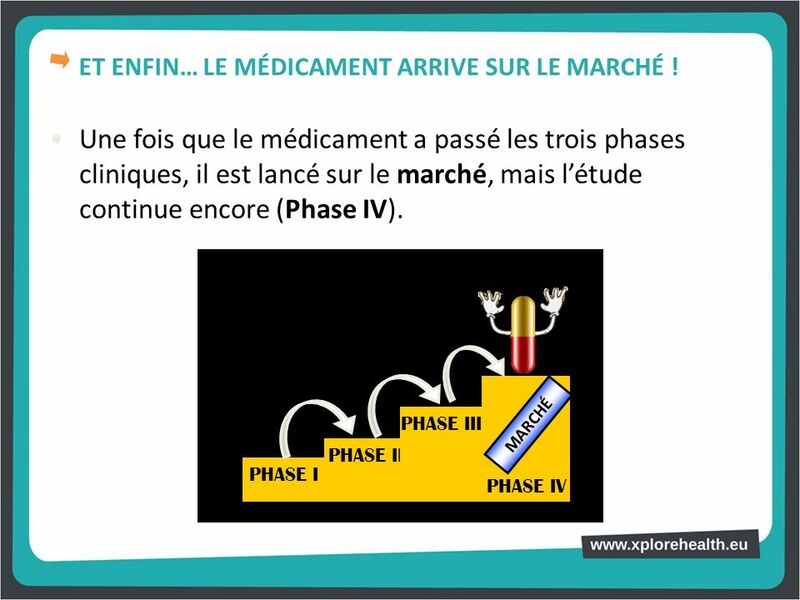 14 ET ENFIN… LE MÉDICAMENT ARRIVE SUR LE MARCHÉ ! 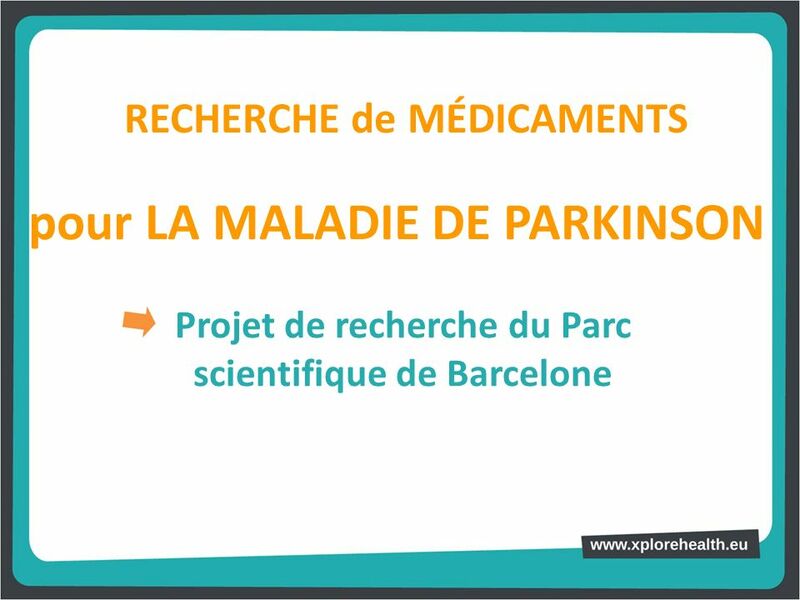 RECHERCHE de MÉDICAMENTS pour LA MALADIE DE PARKINSON Projet de recherche du Parc scientifique de Barcelone Now that you know how medicines are obtained, we are going to explain a specific research project being conducted in Barcelona Science Park in which you will be participating today. 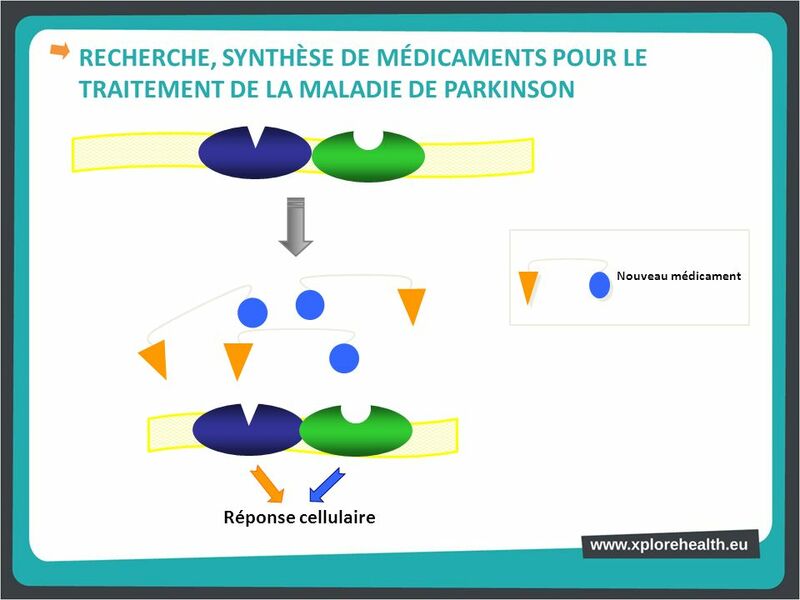 The purpose of the project is to search for compounds for treating patients with Parkinson’s disease. 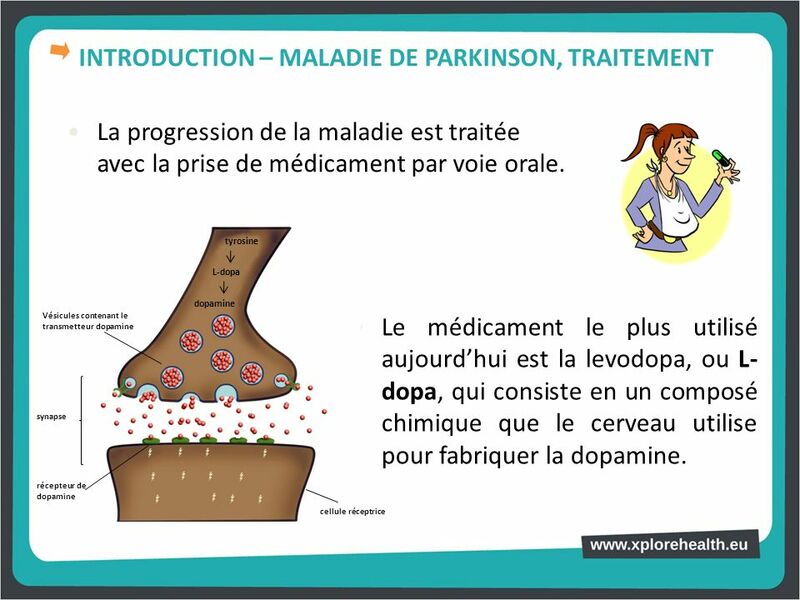 16 INTRODUCTION – QU’EST-CE QUE LA MALADIE DE PARKINSON ? 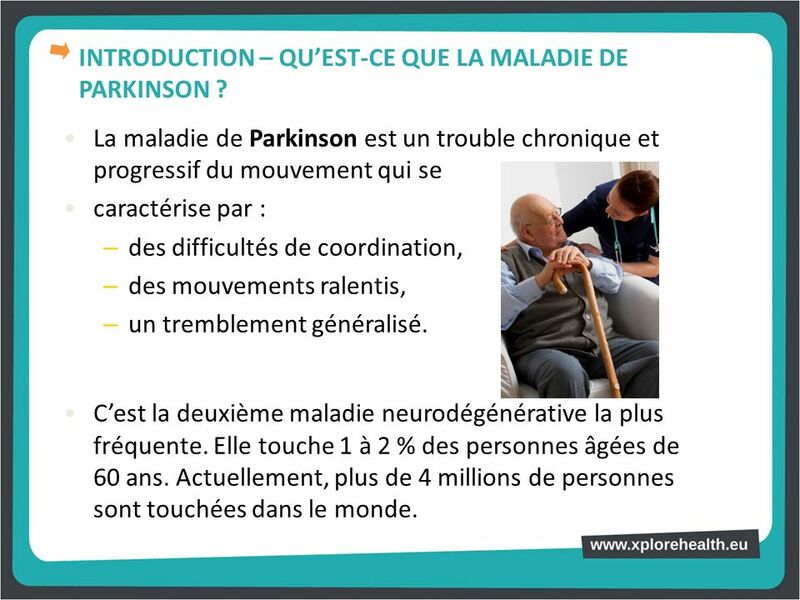 La maladie de Parkinson est un trouble chronique et progressif du mouvement qui se caractérise par : des difficultés de coordination, des mouvements ralentis, un tremblement généralisé. C’est la deuxième maladie neurodégénérative la plus fréquente. Elle touche 1 à 2 % des personnes âgées de 60 ans. Actuellement, plus de 4 millions de personnes sont touchées dans le monde. The subject of Parkinson’s disease can be approached by asking the students whether they are familiar with the disease, what happens to people who have it and which cells or tissues are affected, etc. 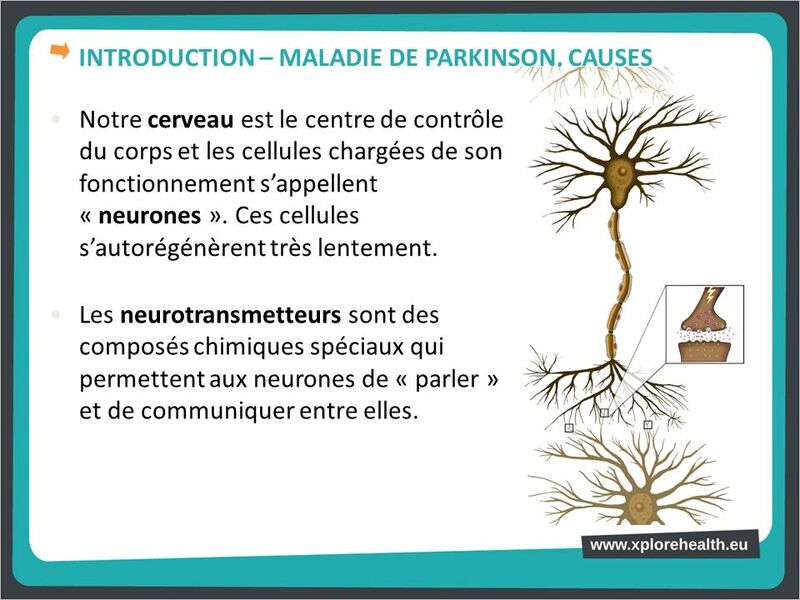 Notre cerveau est le centre de contrôle du corps et les cellules chargées de son fonctionnement s’appellent « neurones ». Ces cellules s’autorégénèrent très lentement. Les neurotransmetteurs sont des composés chimiques spéciaux qui permettent aux neurones de « parler » et de communiquer entre elles. 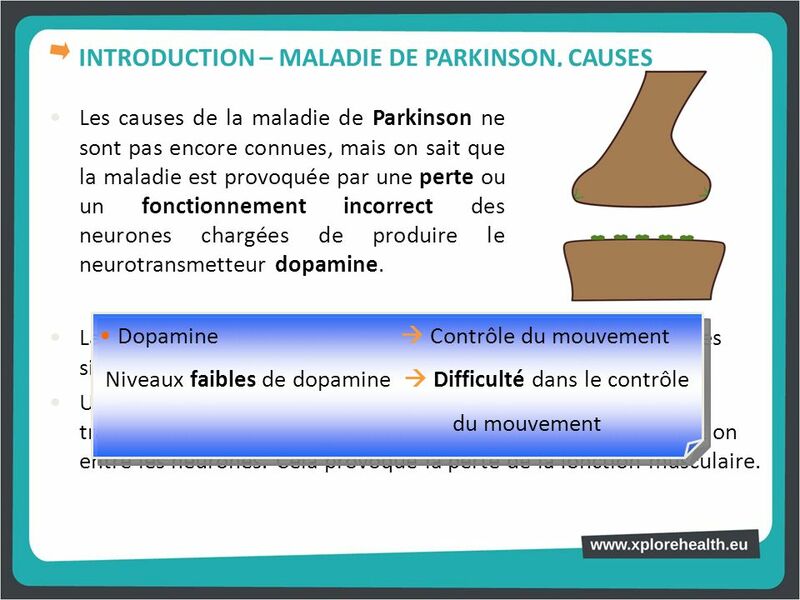 Les causes de la maladie de Parkinson ne sont pas encore connues, mais on sait que la maladie est provoquée par une perte ou un fonctionnement incorrect des neurones chargées de produire le neurotransmetteur dopamine. Dopamine  Contrôle du mouvement Niveaux faibles de dopamine  Difficulté dans le contrôle du mouvement La dopamine est le neurotransmetteur chargé de transmettre les signaux pour contrôler le mouvement de nos muscles. 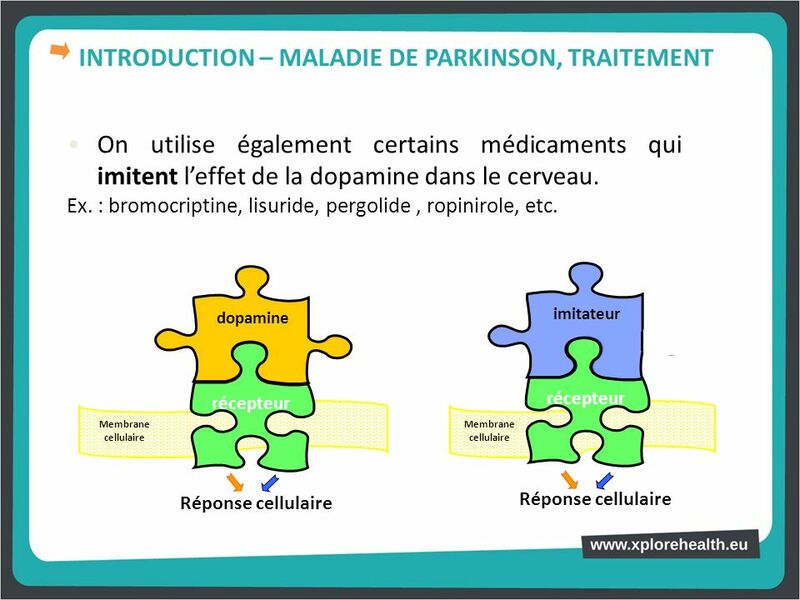 Un déficit en dopamine provoque donc un déséquilibre dans la transmission neuronale qui entraîne une mauvaise communication entre les neurones. Cela provoque la perte de la fonction musculaire. 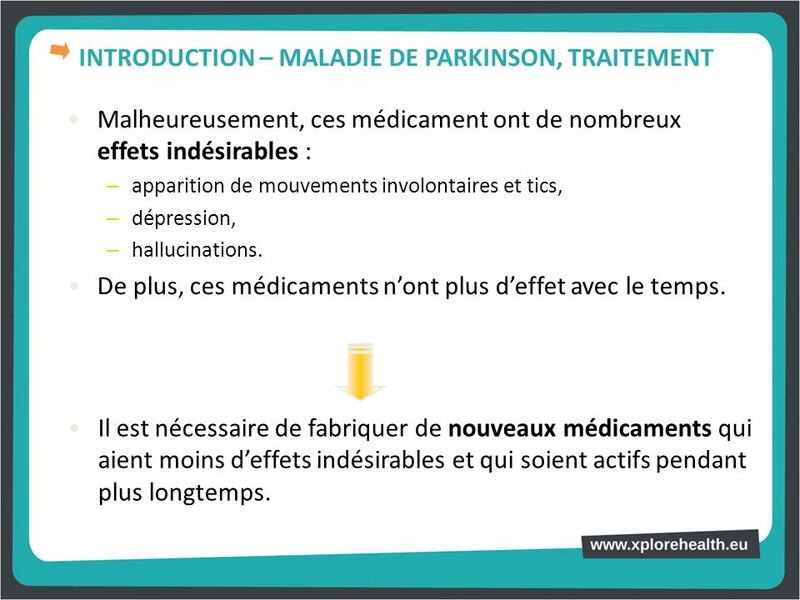 Malheureusement, ces médicament ont de nombreux effets indésirables : apparition de mouvements involontaires et tics, dépression, hallucinations. De plus, ces médicaments n’ont plus d’effet avec le temps. 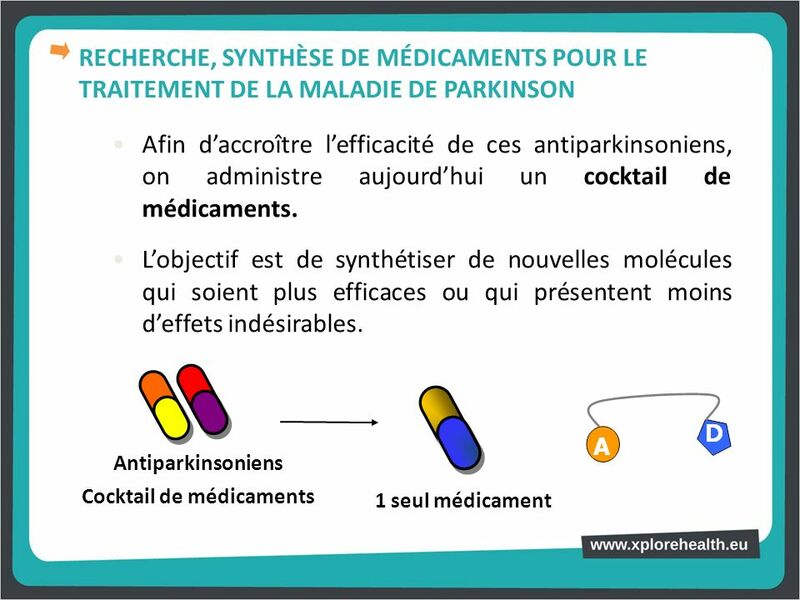 Il est nécessaire de fabriquer de nouveaux médicaments qui aient moins d’effets indésirables et qui soient actifs pendant plus longtemps. 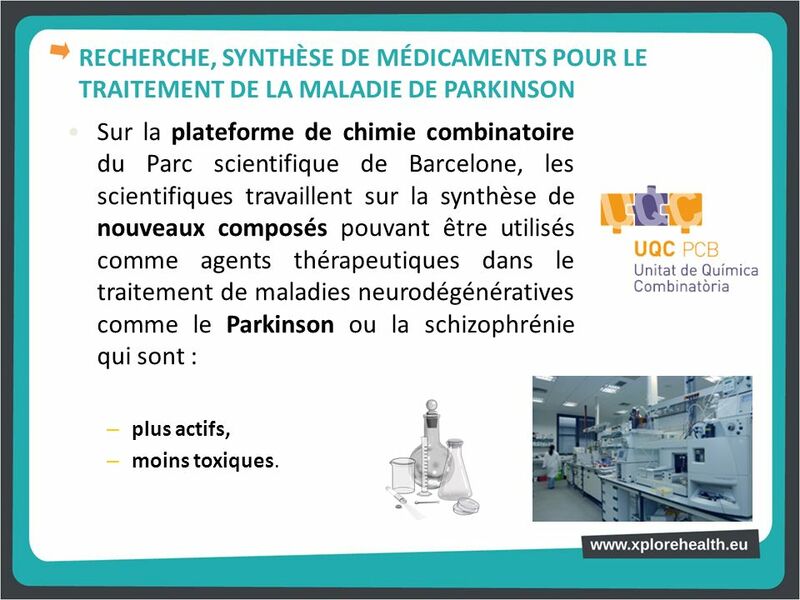 Sur la plateforme de chimie combinatoire du Parc scientifique de Barcelone, les scientifiques travaillent sur la synthèse de nouveaux composés pouvant être utilisés comme agents thérapeutiques dans le traitement de maladies neurodégénératives comme le Parkinson ou la schizophrénie qui sont : plus actifs, moins toxiques. 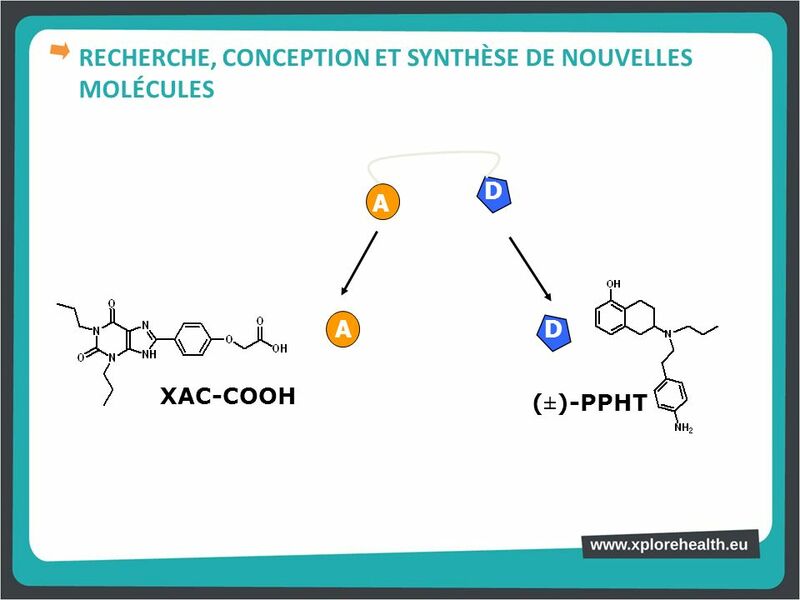 A A D XAC-COOH (±)-PPHT The two compounds that we are joining to form the drug are those shown on the slide. 26 COMMENT SYNTHÉTISE-T-ON CES NOUVELLES MOLÉCULES DANS LE LABORATOIRE ? How do we synthesise these compounds in the lab? To obtain a chemical compound in the lab, we start with simple commercial compounds and use chemical reactions –such as reductions, oxidations, hydrolysis...) to obtain the desired product. 27 COMMENT SYNTHÉTISE-T-ON CES NOUVELLES MOLÉCULES DANS LE LABORATOIRE ? 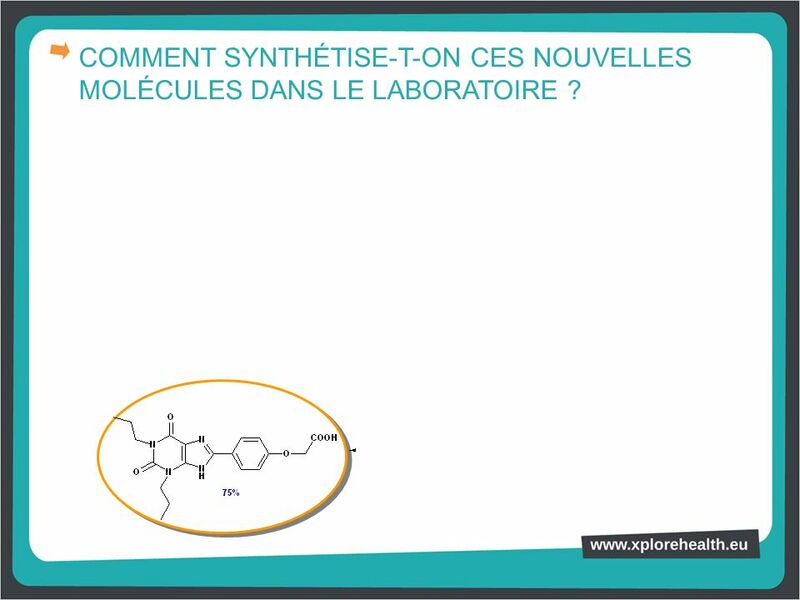 reflux dans EtOH jours This slide shows the synthesis of this compound, which is obtained through 7 stages in the lab. 28 COMMENT SYNTHÉTISE-T-ON CES NOUVELLES MOLÉCULES DANS LE LABORATOIRE ? 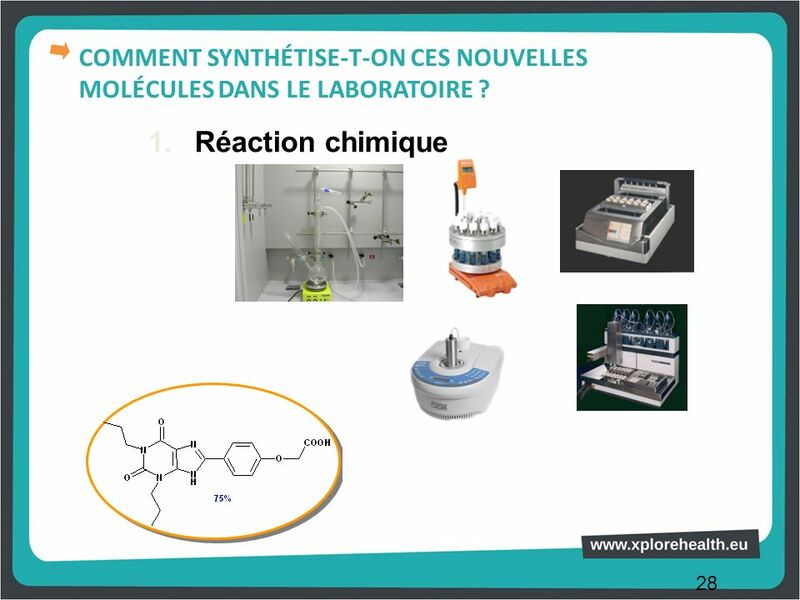 Réaction chimique Each stage comprises a series of steps. The first is to carry out a chemical reaction, in which two or more compounds generate a third. This chemical reaction can be obtained manually or by using automatic instruments. 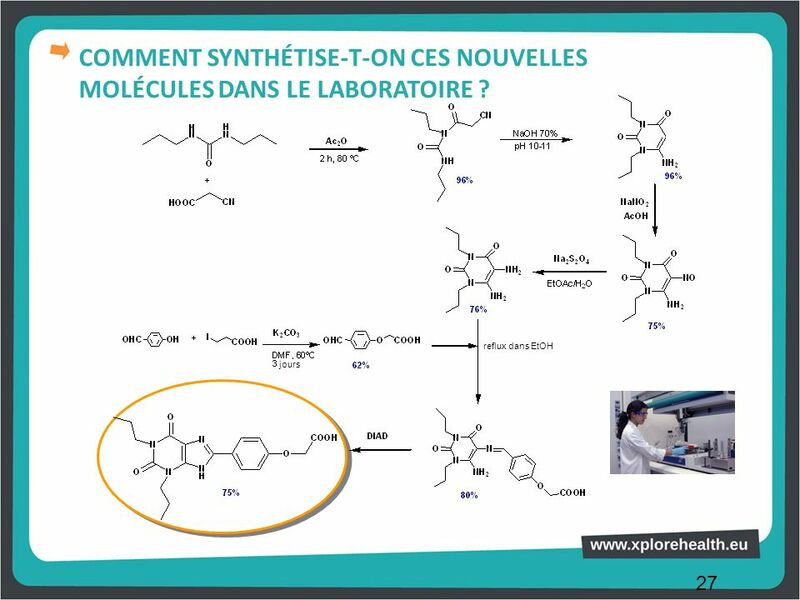 COMMENT SYNTHÉTISE-T-ON CES NOUVELLES MOLÉCULES DANS LE LABORATOIRE ? 2. 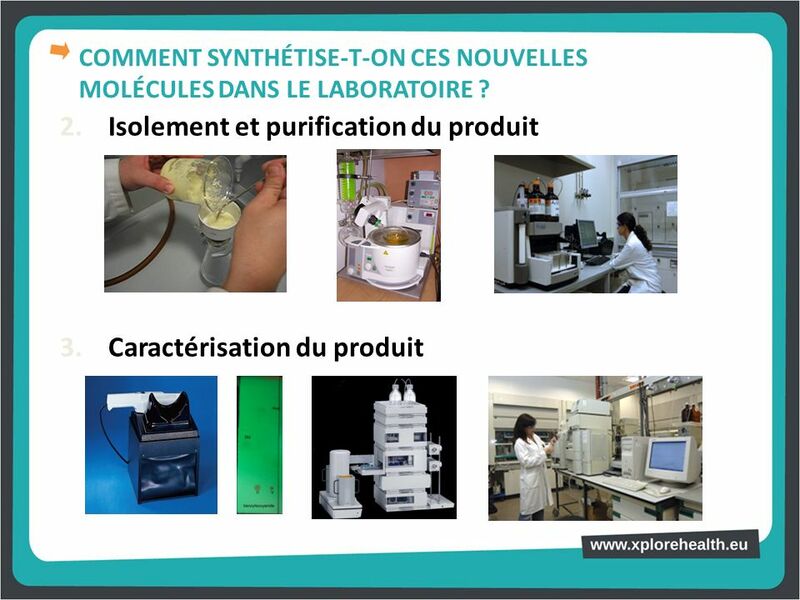 Isolement et purification du produit 3. 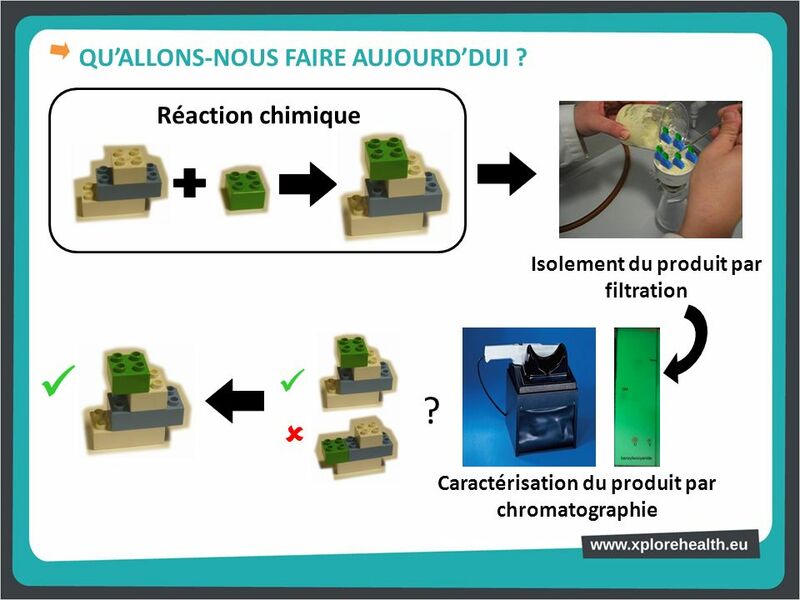 Caractérisation du produit Once the reaction is complete, we have to check that we have done it properly: we first isolate the product, sometimes it’s necessary to purify it. It then has to be characterised to make sure that we have really obtained the desired product. This can be done with simple techniques, such as the thin-layer chromatography (TLC) that you will be using today, or using more complex instruments. 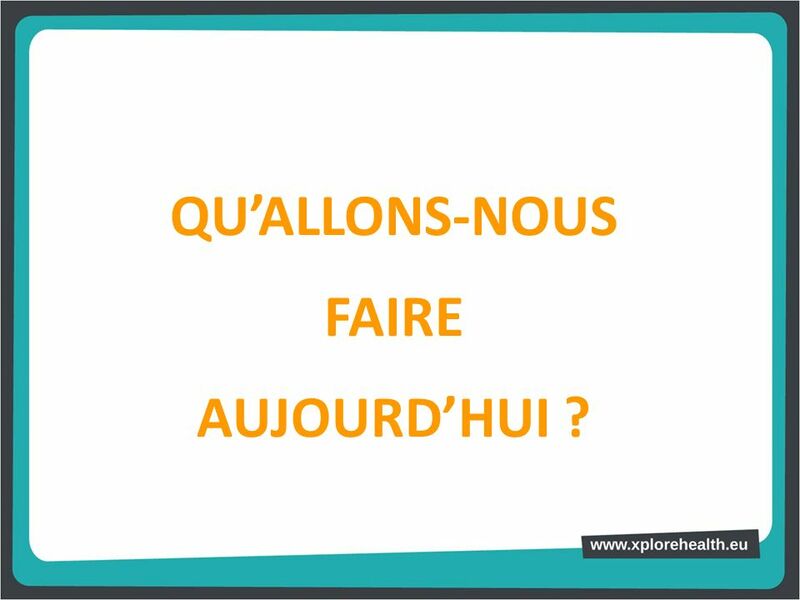 30 QU’ALLONS-NOUS FAIRE AUJOURD’HUI ? 31 COMMENT SYNTHÉTISE-T-ON CES NOUVELLES MOLÉCULES DANS LE LABORATOIRE ? 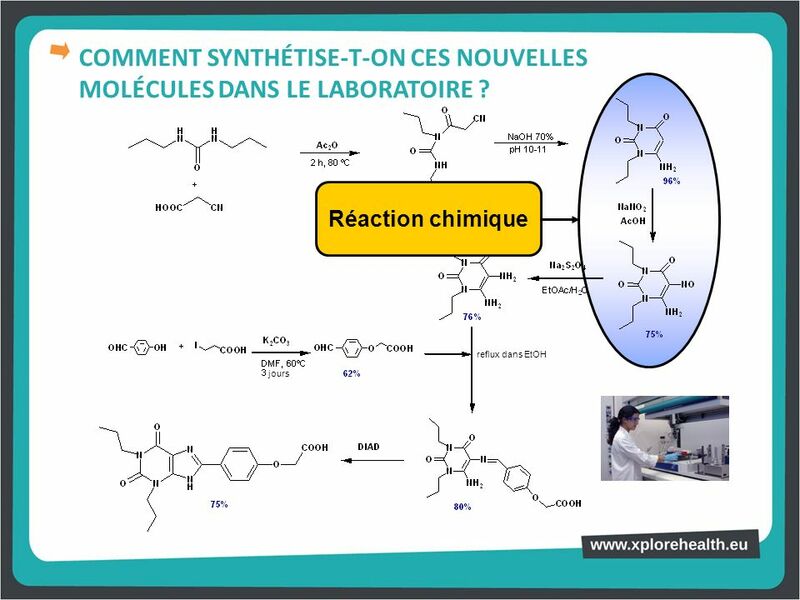 Réaction chimique reflux dans EtOH jours Today you will be participating in one of the 7 steps involved in the synthesis of the product under study. 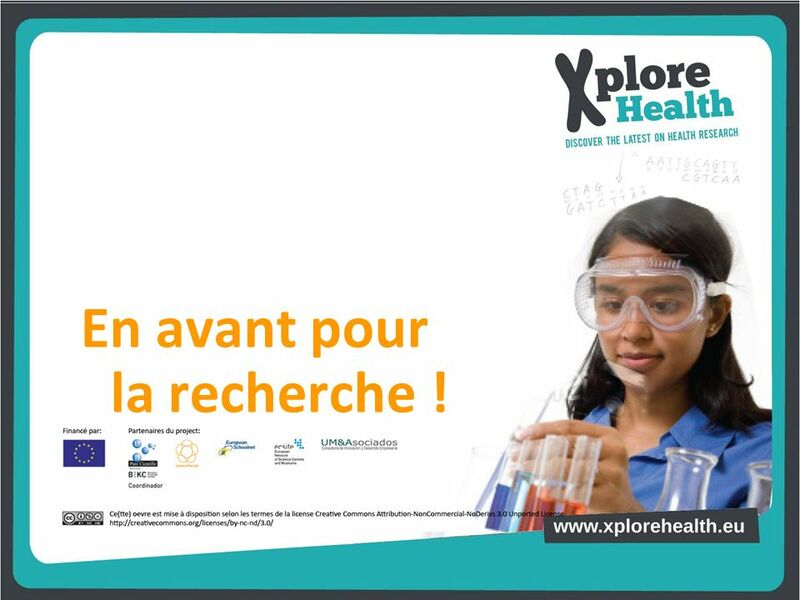 33 En avant pour la recherche ! 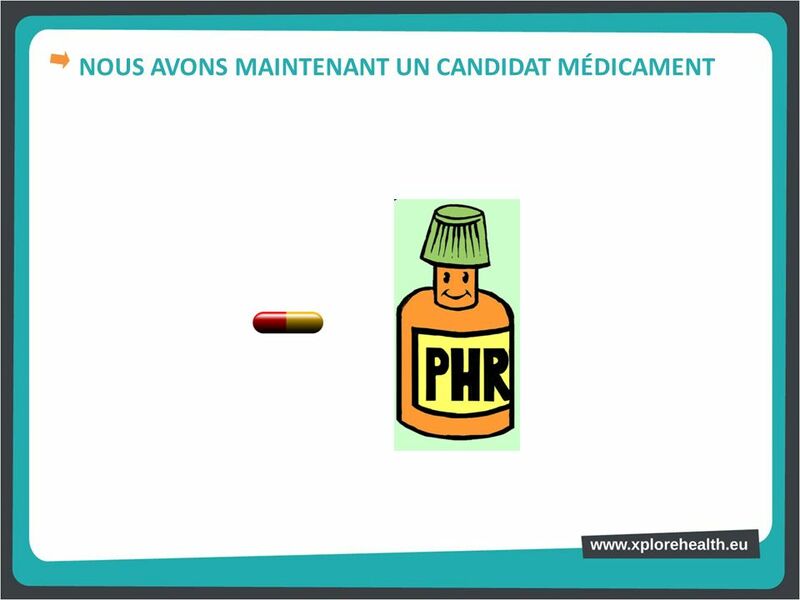 Télécharger ppt "Comment les médicaments sont-ils mis au point ?" Les essais thérapeutiques : pourquoi, comment, pour qui ? Janvier 2010Paul-Marie Bernard Université Laval 1 Évaluation thérapeutique 1.Nouveau traitement 2.Phases dévaluation. 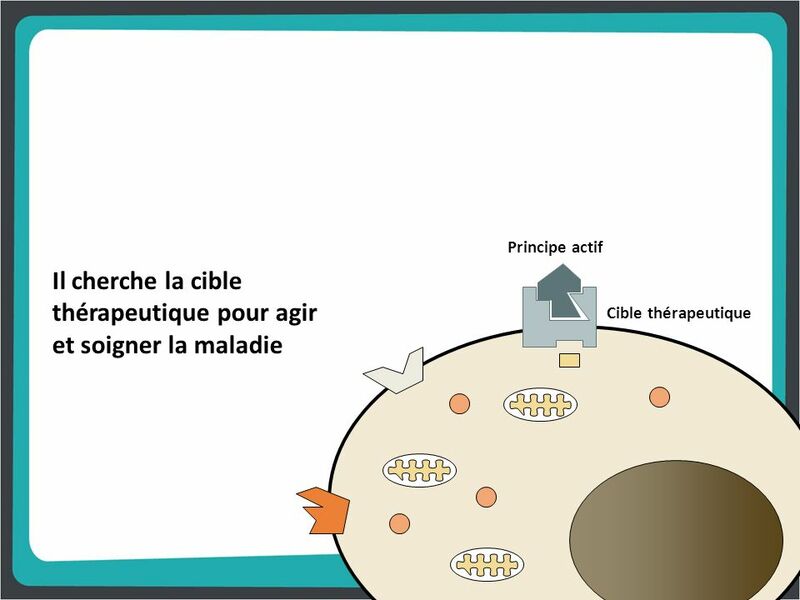 European Patients’ Academy on Therapeutic Innovation Principes clés de pharmacologie.